The Department of Health and Wellness has prepared communications materials for distribution to patients which explain the Nova Scotia Drug Information System. These communications include the following. Your pharmacy will receive a supply of these communications materials prior to connecting to the Drug Information System. 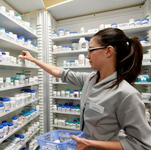 Community pharmacies started connecting to the Drug Information System in the fall of 2013.